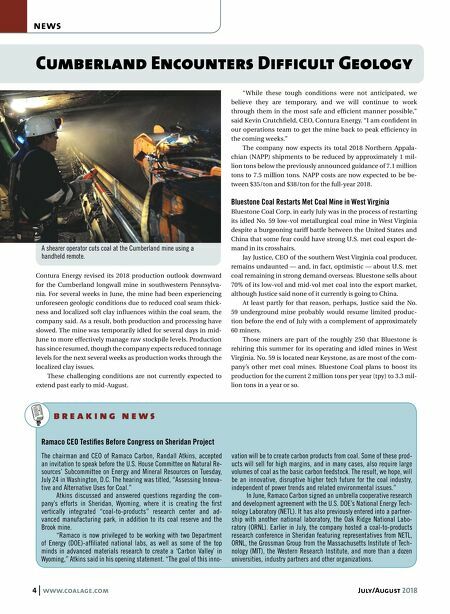 4 www.coalage.com July/August 2018 news Cumberland Encounters Diff icult Geology b r e a k i n g n e w s Ramaco CEO Testifies Before Congress on Sheridan Project The chairman and CEO of Ramaco Carbon, Randall Atkins, accepted an invitation to speak before the U.S. House Committee on Natural Re- sources' Subcommittee on Energy and Mineral Resources on Tuesday, July 24 in Washington, D.C. The hearing was titled, "Assessing Innova- tive and Alternative Uses for Coal." Atkins discussed and answered questions regarding the com- pany's efforts in Sheridan, Wyoming, where it is creating the first vertically integrated "coal-to-products" research center and ad- vanced manufacturing park, in addition to its coal reserve and the Brook mine. "Ramaco is now privileged to be working with two Department of Energy (DOE)-affiliated national labs, as well as some of the top minds in advanced materials research to create a 'Carbon Valley' in Wyoming," Atkins said in his opening statement. "The goal of this inno- vation will be to create carbon products from coal. Some of these prod- ucts will sell for high margins, and in many cases, also require large volumes of coal as the basic carbon feedstock. The result, we hope, will be an innovative, disruptive higher tech future for the coal industry, independent of power trends and related environmental issues." In June, Ramaco Carbon signed an umbrella cooperative research and development agreement with the U.S. DOE's National Energy Tech- nology Laboratory (NETL). It has also previously entered into a partner- ship with another national laboratory, the Oak Ridge National Labo- ratory (ORNL). Earlier in July, the company hosted a coal-to-products research conference in Sheridan featuring representatives from NETL, ORNL, the Grossman Group from the Massachusetts Institute of Tech- nology (MIT), the Western Research Institute, and more than a dozen universities, industry partners and other organizations. Contura Energy revised its 2018 production outlook downward for the Cumberland longwall mine in southwestern Pennsylva- nia. For several weeks in June, the mine had been experiencing unforeseen geologic conditions due to reduced coal seam thick- ness and localized soft clay influences within the coal seam, the company said. As a result, both production and processing have slowed. The mine was temporarily idled for several days in mid- June to more effectively manage raw stockpile levels. Production has since resumed, though the company expects reduced tonnage levels for the next several weeks as production works through the localized clay issues. These challenging conditions are not currently expected to extend past early to mid-August. "While these tough conditions were not anticipated, we believe they are temporary, and we will continue to work through them in the most safe and efficient manner possible," said Kevin Crutchfield, CEO, Contura Energy. "I am confident in our operations team to get the mine back to peak efficiency in the coming weeks." The company now expects its total 2018 Northern Appala- chian (NAPP) shipments to be reduced by approximately 1 mil- lion tons below the previously announced guidance of 7.1 million tons to 7.5 million tons. NAPP costs are now expected to be be- tween $35/ton and $38/ton for the full-year 2018. 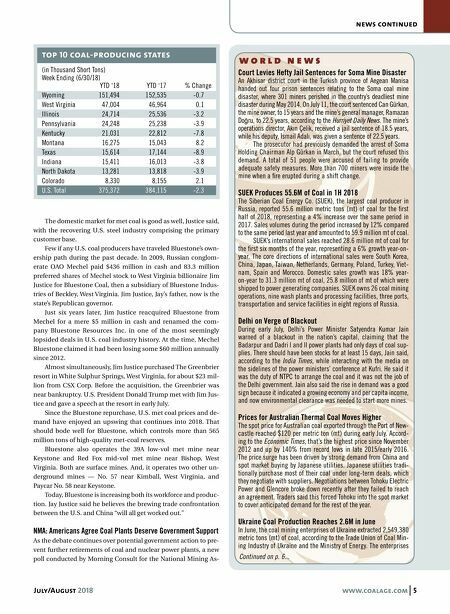 Bluestone Coal Restarts Met Coal Mine in West Virginia Bluestone Coal Corp. in early July was in the process of restarting its idled No. 59 low-vol metallurgical coal mine in West Virginia despite a burgeoning tariff battle between the United States and China that some fear could have strong U.S. met coal export de- mand in its crosshairs. Jay Justice, CEO of the southern West Virginia coal producer, remains undaunted — and, in fact, optimistic — about U.S. met coal remaining in strong demand overseas. Bluestone sells about 70% of its low-vol and mid-vol met coal into the export market, although Justice said none of it currently is going to China. At least partly for that reason, perhaps, Justice said the No. 59 underground mine probably would resume limited produc- tion before the end of July with a complement of approximately 60 miners. Those miners are part of the roughly 250 that Bluestone is rehiring this summer for its operating and idled mines in West Virginia. No. 59 is located near Keystone, as are most of the com- pany's other met coal mines. Bluestone Coal plans to boost its production for the current 2 million tons per year (tpy) to 3.3 mil- lion tons in a year or so. A shearer operator cuts coal at the Cumberland mine using a handheld remote.